The George Harrison file in my cabinet is stuffed full of info about his stalker, and his health. I think George was a truly good man, who just wanted his privacy. I remember the night he died. I was in a bar in Brixton, and they played “My Sweet Lord.” Great to hear that song anyway, but in a bar, full of people, with an amazing sound system, it really was incredible, and I cherish that. Sorta like the day Bette Davis died. I was in the bar Berlin in Chicago, and they played the Kim Carnes video. It was really moving, and totally cool. So, back to the story. George was a heavy smoker, and developed lung cancer after having already overcome throat cancer in ’98. 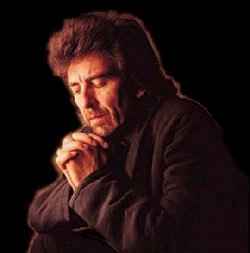 On November 7, 2001, George was supposedly receiving “last chance” cancer treatment in Staten Island University Hospital, under the name Arias, the maiden name of his wife. Apparently during his hospital stay here, he got in touch with security man Gavin de Becker. De Becker does a lot of celebrity security, and they began to map out plans for a secretive funeral for George. George decided he would not return to his mansion in the UK, and he refused to die in a hospital. This is when I think Paul McCartney stepped in, and offered his own place in Beverly Hills. 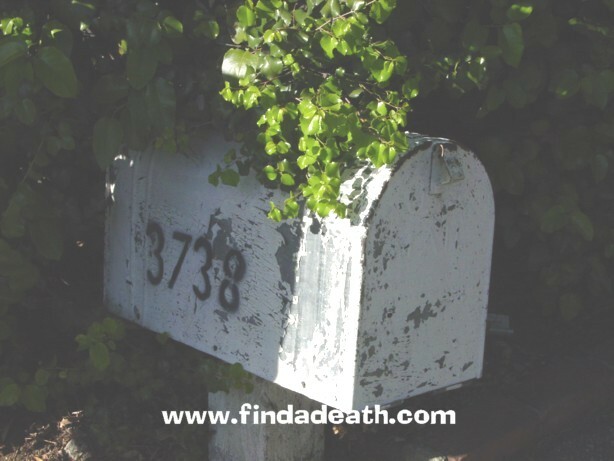 Officially de Becker offered his place in Laurel Canyon – with this mailbox, but I think this is a smoke screen. 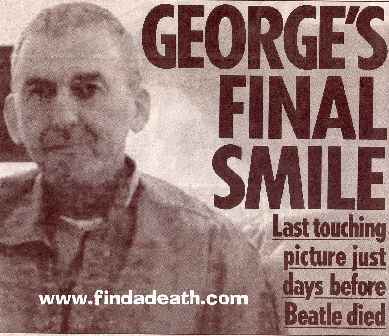 One of the British rags rolled out this picture, which is supposed to be the last one of George, taken just days before he died. 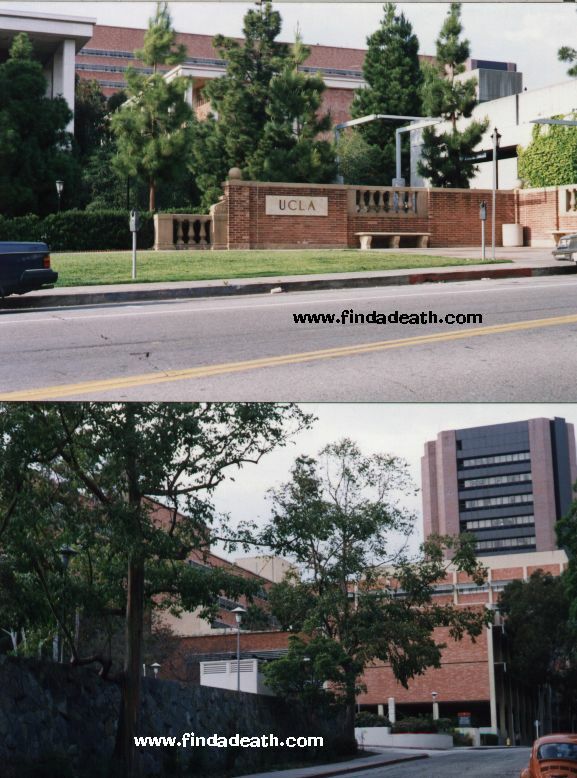 George comes to Los Angeles, with a stop at UCLA Medical Center, for drugs and pain management. 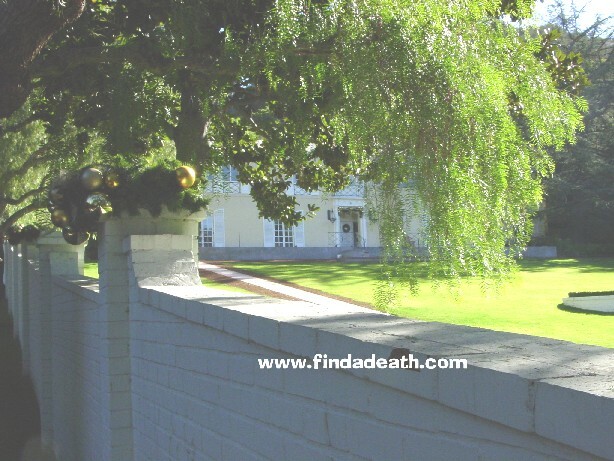 Then he departs to Paul’s house on Heather in Beverly Hills, to die. It was 36 hours of George drifting in and out of consciousness, with his wife and son at his side. One outsider allowed was George’s friend Ravi Shankar, who played sitar music. According to Shankar, George positioned two pictures of Hindu gods Krishna and Rama around his bed, and he chanted the Krishna mantra. 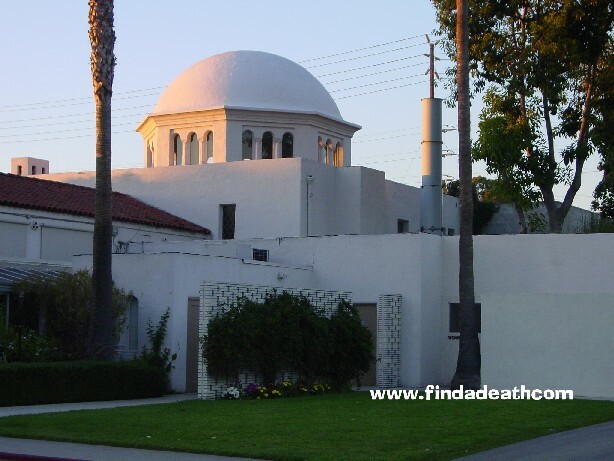 Two more of George’s close friends from the Krishna faith, Shayam Sundara and Mukunda, were there chanting quietly into their meditation beads, while George passed away at 1:20 p.m. on the 29th of November, 2001. His body was wrapped in a shawl, and covered with holy oils. 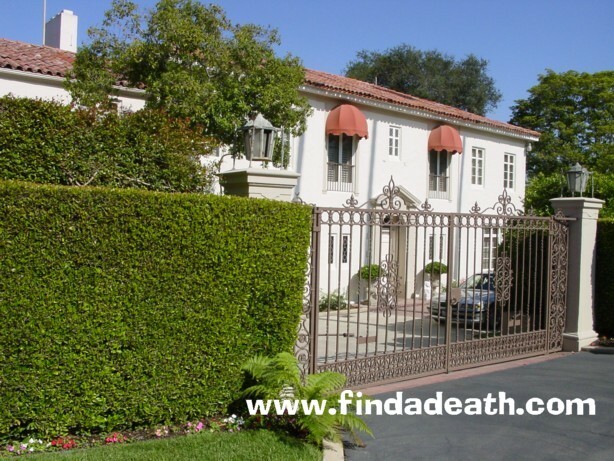 20 minutes after his death, the friendly folks at Hollywood Forever Cemetery drove up Coldwater Canyon to pick up George. They briefly joined hands with the Harrison family and the security staff, and said a small prayer. 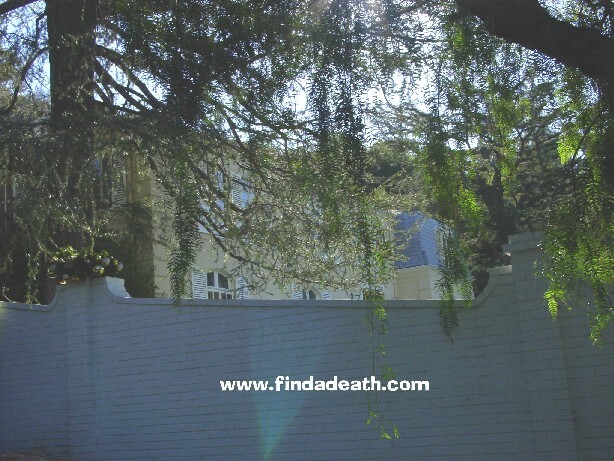 They stopped briefly at the doctors office in an unmarked white van, had the doc sign the death certificate, and then brought him back to the cemetery crematorium, and George was cremated in a cardboard casket, within 10 hours of his death, in the same place Mama Cass was. His family took George’s cremains to their Hawaiian home, then on to India where he was scattered over the Ganges River, according to Krishna faith. The fun begins. 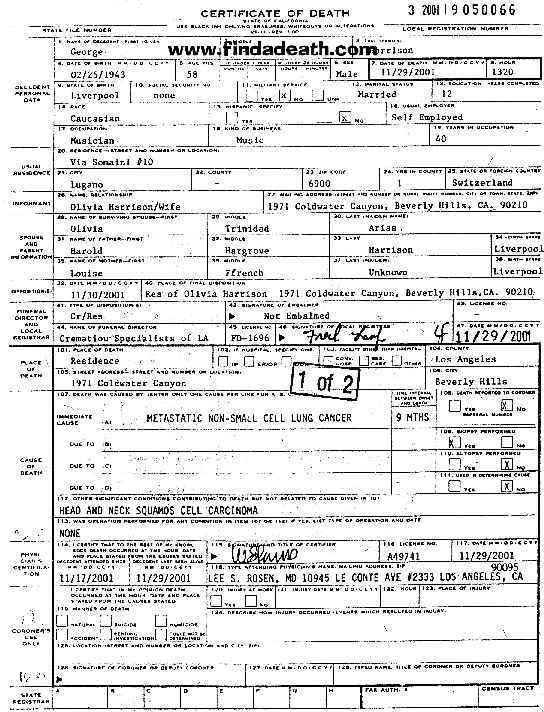 His death certificate is released. They put a phony address on it. Gloria Allred – who would blow you for an inch of column space – makes it her job to make sure the proper information is out there. 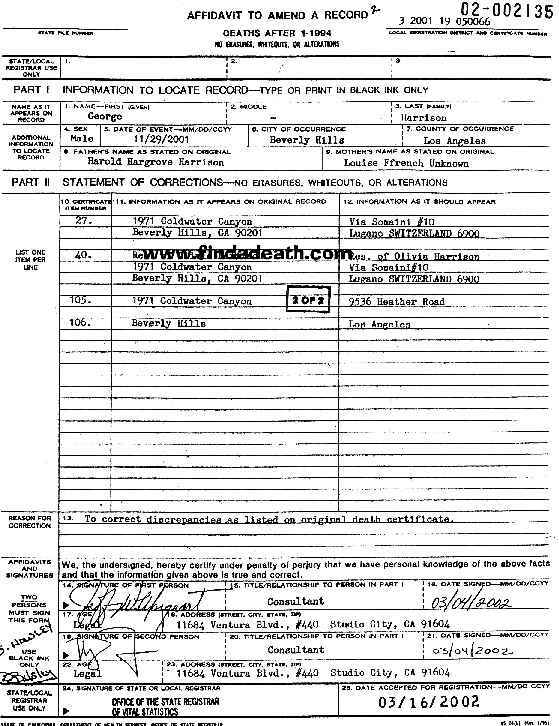 They release an updated death certificate with de Becker’s address on it. They even release a (what I think is obviously fabricated photo) of George and Olivia standing in front of de Becker’s mailbox. Everyone is supposedly happy, but I’m sure it’s still wrong, and George really did die in McCartney’s house. They just didn’t want to have it become a shrine. In January 2002, his former brother in law offered up a bunch of cardboard boxes packed full of George’s things. Apparently George let him live in his LA mansion rent free, and it was destroyed in a mudslide, but he managed to keep some things. 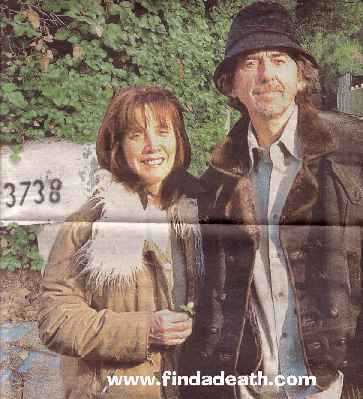 The very litigious Olivia Harrison got a whiff of it, and they set up a sting operation, retrieving the belongings. 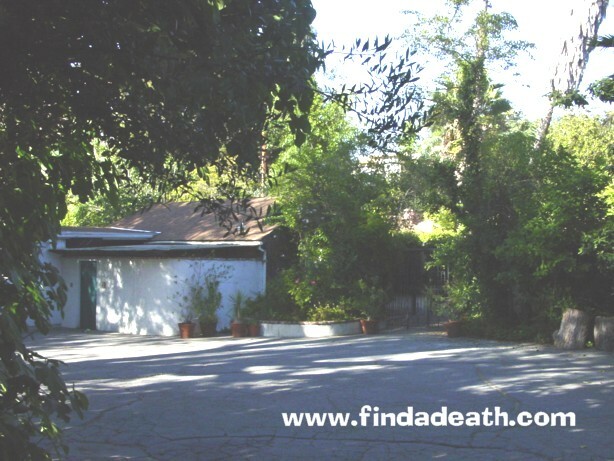 The Beatles used this home in Bel Air, as their home base during their first North America tour. 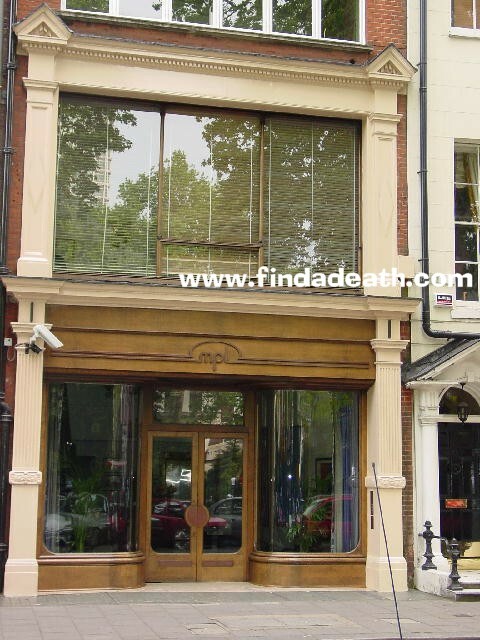 This is Paul McCartney’s office in Soho Square, London. From my friend Dave: Lennon never spoke to him after George’s autobiography barely mentioned John, and then John got shot. George never liked McCartney, and he had a weird relationship with Eric Clapton, because of the Patti Boyd thing (he did a version of Bye Bye Love where he pretended Clapton and Boyd were on backing vocals, but they weren’t. In fact she’d just gone off with Clapton). One book, the one about Don Simpson, the Top Gun producer who died, claimed that George liked coke, not very Buddhist. Story states that two of George’s Hare Krishna friends were there with him at the end. According to Gavin De Becker, this is not true. Those guys were hanging around outside after George died and telling everyone from the press they were with George at the end, but De Becker says (and he would know) that they weren’t there, and that there was no chanting or Hare Krishna business going on when George died. Also, I’m not sure if he was there at there very end or not, but Harrison spent much of his last days with Jeff Lynne, who produced a couple of George’s records and was in the Traveling Wilburys with him. The two of them would just sit around and play ukuleles all day. I read your George Harrison page recently and recalled an interview with Mike Myers. Apparently after Harrison’s death, he was approached by a private investigator who had the last letter Harrison wrote. It was addressed to Myers. He wrote Mike about how much he loved his movies, and could he please have a Mini-me doll sent to him. The letter was written about a few weeks before he died. In the interview Myers says he now has the letter framed in a locked frame, like those that hold the Constitution. Just a bit of trivia from me to you! Take care. His family must be getting over their mourning period, the lawsuits are flying. Did you read about that doctor? WELL! Apparently, (according to what I read) the doctor had his children perform for George, while George was dying. He then took his son’s guitar and gave it to George to sign. Supposedly George said, “I do not even know if I know how to spell my name anymore.” The doc says, “Come on, you can do this.” Then he supposedly held George’s right hand, and guided him through the autograph. 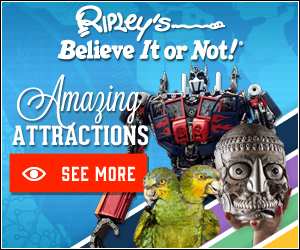 Now, that is tacky. I mean, I could understand wanting to get George to sign something, but thinking better of the situation and not doing it. Honest. Sometimes you should only live with your memories. This is a weird line I have with Findadeath and you may think I’m full of it, but I didn’t make this information up. 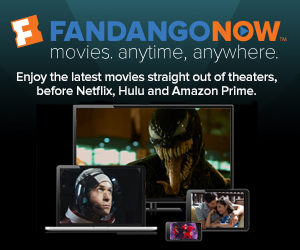 This is available information. If it was my family, or me featured, I sure as hell wouldn’t want private information out there. However, it is out there, and my job is to find it. The doctor was fined $5000 for dishing about George’s condition in the hospital, without family consent. Findadeath.com friend Kieran sends me info about Ringo in 1966, when he had his tonsils taken out: They were destroyed immediately, so no one would use them for souvenirs. I guess it makes sense. Someone was selling Princess Diana’s toenails recently. Thanks to Steve Goldstein, Tom and Mike Steen for all the help here.